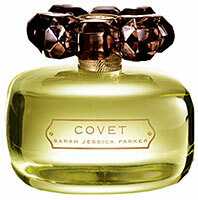 Covet is a fragrance with Sarah Jessica Parker’s name on it. She has other fragrances too, ones that I actually like more. Lovely is a pretty one. That new fragrance she has coming out seems worthwhile too. Covet never really drew me in as I heard its mid-stage can be somewhat intense. And now that I know why, I can safely say this isn’t for me. In Bottle: Soft, citrus, lavender floral with a touch of sweetness–almost licorice-like. Nice green, clean and kind of average smelling. I lower the bar for celebuscents as I really don’t expect these to break any new ground. I just expect them to smell pretty, agreeable and nice. And in the bottle, Covet smells pleasant. Applied: Light, green aromatic floral. A little reminiscent of Spider Lily by India Hicks. Pleasant on application with a slight citrus note that layers and plays well with the greenness of the fragrance. The pleasant top notes last for a few minutes before Covet takes a turn for the sharp and chemical and powerful. After the initial pleasantries are through, Covet turns into a powerful bright green and lemon fragrance that’s more reminiscent of Versace Versense’s crazy powerful citrus than it is of Spider Lily now. Spider Lily had a boundary but Covet does not. It crashes through the boundaries and gives off wave after wave of too-strong lemon and sharpness. I don’t know what’s wrong with me but the citrus in this is really strong and entirely too overpowering. It’s trying to be sweet and sophisticated and pretty but that citrus is just so strong. Finally when Covet enters the dry down stage it mellows out just a little as that chemical green finally lets up and I can smell some sweetness. Extra: I don’t know if this is just my experience or if a small swathe of people out there who also experienced this overpowering green lemon monster mid-stage just have really awkward skin chemistry but we do exist and Covet should be tested prior to purchase. Or you might experience what I did and just be thoroughly perplexed. Design: It’s a cute bottle, little cap is a plastic flower petal ring type thing. It’s easy enough to hold and the design is not over the top. I have to agree with Tania Sanchez and what she said about this bottle in, Perfumes, The A-Z Guide, “The bottle looks like a Super Mario power-up”. It really does. Notes: Geranium leaves, lemon, honeysuckle, lavender, lemon, amber. I suspect one of those lemons–maybe both of them–are causing this sharp over-green explosion every time I try to enjoy a citrus-based fragrance. One of these days I’ll figure it out. Reviewed in This Post: Covet, 2008, Eau de Parfum. This entry was posted in citrus, floral, Reviews By House, spin off and tagged citrus, covet, floral, fragrance, jessica, lavender, parker, perfume, review, sarah, scent. Bookmark the permalink.